Harvard has just given us the most moving tribute of the year. The end of the school term is often a tearful and joyous time for students everywhere. For graduating university and college students especially, it's a moment to reflect and celebrate all of the hard work that will soon culminate in a degree recognizing their educational accomplishments. For the students of Harvard University, a simple celebration honoring this momentous occasion would not do however. That is because the 2018 Commencement Program featured a very special guest, Georgia Congressman John Lewis. Lewis has spent more than 50 years fighting for civil rights and had been hand selected by Harvard as the afternoon's principal speaker. 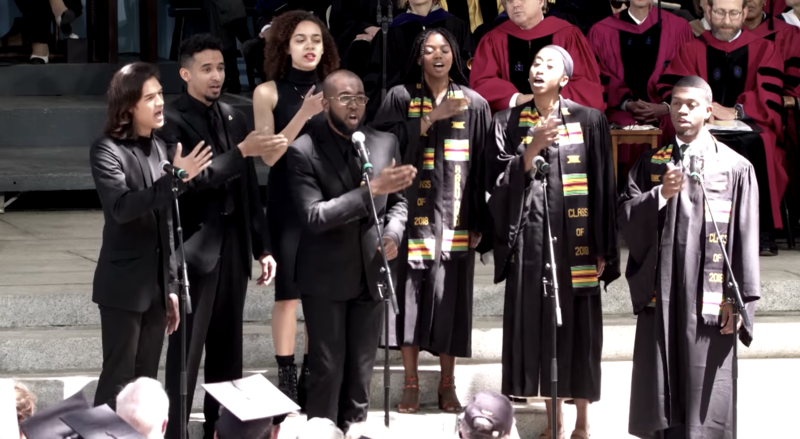 To pay tribute to the event's speaker, 2016 Harvard alum Joshua Campbell and a band of other students performed a soul-shaking, a cappella rendition of Campbell's "Sing Out, March On." The original song depicts a story of struggle and how one must use their voice to "sing out" and "march on." See the live performance below and prepare to be stunned.